Apple iPad uses a MicroSIM instead of normal SIM card. And many operators can just give you a normal SIM. So what’s the solution? How To Convert a SIM to a MicroSIM with a Meat Cleaver! article tells that you can do the conversion from normal SIM to MicroSIM with a chopping board, a meat cleaver and a pair of scissors – simple! There is a good series of pictures and description how to do the job. If you don’t to do the cutting manually, there are commercially made MicroSIM cutters like Fuj:tech microSIM-leikkuri. Giesecke & Devrient (G&D) presents the world’s smallest SIM card: the nano-SIM. A third smaller than the micro-SIM, the nano-SIM enables manufacturers to produce devices that are even thinner and perform even better. Measuring approximately 12mm x 9mm, the nano-SIM is about 30 percent smaller than the micro-SIM. The thickness of the cards has been reduced by about 15 percent. The standardization of the nano-SIM is expected to be implemented through the ETSI (European Telecommunications Standards Institute) by the end of the year. This new development from G&D could be finding its way into the first mobile devices as early as next year. Perhaps to SIM card inventor Giesecke & Devrient’s surprise, its nano-SIM proposal introduced late last year didn’t fly through standardization unopposed: instead, the process for crafting a next-gen SIM standard has devolved into an all-out war pitting Apple against many of the other major players in the phone industry, FT reports. Regardless of which faction wins, we’re bracing for yet another all-new SIM standard coming down the pike, which means new cards, new adapters, and new hassles for carriers. Nokia is reportedly fighting the Apple-based proposal for a nano-SIM with designs of its own, aimed at preventing Cupertino scooping the patent fees which come with ratification. Despite repeated enquiries, Nokia has failed to provide any confirmation or denial of the Financial Times’s report that Nokia – concerned that Apple is poised to grab the lion’s share of patent revenue – has proposed an alternative design to the proposed nano-SIM technology to standards body ETSI. Some very early GSM phones even used full-sized cards, tucked under the battery, but that quickly became impractical and the SIM as we know it (technically known as the Universal Integrated Circuit Card, UICC) became ubiquitous. Apple wanted more space for the iPhone 4, and so took advantage of the largely ignored mini-UICC, which became known as the micro-SIM in order to create even more confusion. Micro-SIMs are now used in a handful of the slimmest smartphones, but to make them even slimmer Apple wants to trim off even more of the fat. That has led to an Apple-led ETSI project to create a nano-SIM as much as 40 per cent smaller than the mini-SIM, including a marked reduction in depth which will make it a lot harder to trim an existing SIM with a pair of nail clippers. If Nokia has indeed proposed an alternative nano-SIM, then the ETSI will have to decide which to incorporate as a standard. Last week, Apple and Nokia got into a very public dust-up over the future of the SIM card — a staple in phones all around the world — thanks to a Financial Times article pointing out that the two had filed competing proposals with the European Telecommunications Standards Institute (ETSI) for the so-called “fourth form factor (4FF) UICC,” more commonly known as the “nano-SIM.” The nano-SIM proposals seek to standardize a new SIM card that would be even smaller than the current micro-SIM popularized by the iPhone, freeing precious extra millimeters inside the phone’s chassis for more circuitry, more battery capacity, and slimmer profiles. Apple suggests that the nano-SIM should effectively be a micro-SIM stripped of virtually all its plastic. Apple maintains the old configuration; in other words, with an adapter, you could theoretically use their nano-SIM in a micro-SIM or mini-SIM phone sold today. The Apple proposal, being stripped of all plastic surrounding the contacts, requires some external holder to keep it in place. Nokia points out that its proposal wouldn’t require a tray or other SIM carrier — in all likelihood, that means that the Nokia design has notches that would allow it to be held in place in a slot. 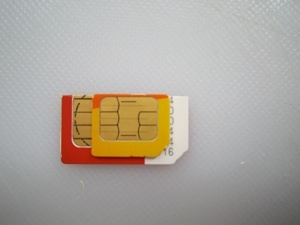 Nano-SIM cards would be thinner and considerably smaller than micro-SIM cards. Apple has the support of “most of the European operators”, according to the FT. The two camps are heading for a showdown later this week (on Thursday and Friday) at the Smart Card Platform Plenary meeting of the European Telecommunications Standards Institute (ETSI) in Sophia Antipolis (Southern France). Apple’s royalty-free nano-SIM is an empty promise, because the company doesn’t have any essential patents related to its nano-SIM proposal, a Nokia spokesman said on Monday. But Apple wants to go one step further. The company will grant royalty-free licenses to any Apple patents essential to nano-SIM, provided that Apple’s proposal is adopted as a standard and that all other patent holders accept the same terms, according to a letter that a source showed patent analyst and blogger Florian Mueller. “We are not aware of any Apple Intellectual Property which it considers essential to its nano-SIM proposal. In light of this, Apple’s proposal for royalty-free licensing seems no more than an attempt to devalue the intellectual property of others,” a spokesman said via email. For example, it has completely different dimensions from today’s micro-SIM cards, while Apple’s proposed card has the same length as the width of current micro SIMs, and so would risk jamming if users tried to force it into devices, leading to card and product damage, Nokia said. Also, Apple’s proposal requires a tray, which increases cost and takes up more room. The European Telecommunications Standardization Search has approved Apple ‘s proposal for a new SIM card standard. The new size is officially called 4ff, and is roughly 40 percent less than the current smallest sim-cards.